This piece is composed of 2 layers of 3/4" thick starfire glass with a thin layer of dichroic glass laminated in between. 6 inches long on each side. Mounted on starfire base. This piece is similar to what I teach in my sculpture class. Photos do not do this kind of work justice. This piece was made previous to the sword, and is also beveled on both sides from 3/4" thick glass.. A beautiful custom made walnut stand was made to hold it. Private collection. 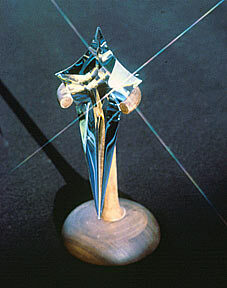 This sculpture was made from optical lead glass. 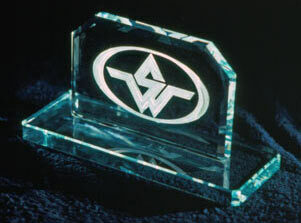 An engraved line was added all around the piece in both directions, creating many wonderful reflections. Approx. 5" X 5" X 5". Private collection. I was lucky to obtain one of the largest faceting machines in the world, capable of holding up to 30 pounds. 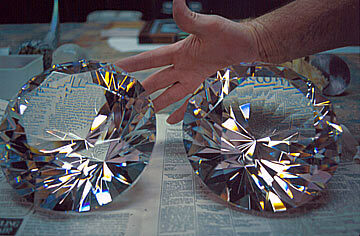 These two headlight size brilliant cut diamonds are made from the finest optical lead crystal. 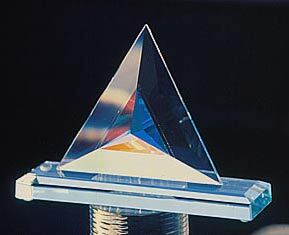 They began as a thirty pound block of glass, two thirds of the weight is cut away in the faceting process. They weigh about ten pounds each, and are eight inches across. One in private collection, and one in the collection of the artist. 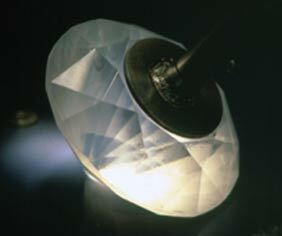 This photo shows one of the diamonds still attached to the faceting head. This was the last step before polishing the piece. This is still done by hand, the head only holds the glass in place. 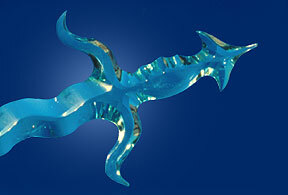 Cut out of a single piece of 3/4" thick glass, this sculpture is beveled on both sides, making it quite functional. 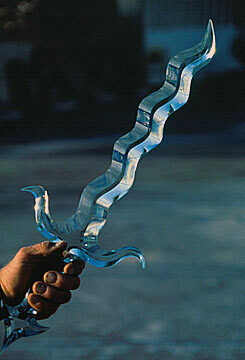 The edge of the sword comes close to a knife edge, but is softened a little so the piece would not get damaged. The handle has notches that conform exactly to your fingers, and the piece feels quite amazing to hold. Approx. 23 inches long, and 8 inches wide across the hand guard. In the collection of the artist. 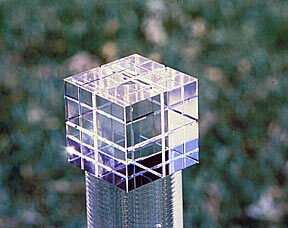 and rests on a 48" tall basalt column, with a very powerful LED built into the column to illuminate the glass. 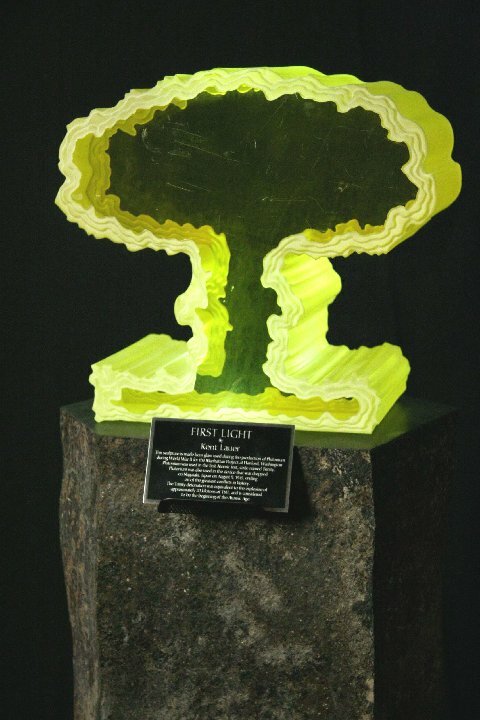 The sculpture is entitled "First Light" and is in the permanent collection of the Atomic Testing Museum in Las Vegas.